If wandering through striking savanna landscapes, plunging into pristine natural rockpools, and setting off on a 4WD outback adventure sounds like your cup of traveller’s tea, you’ll get all that and more at Maguk (Barramundi Gorge). Located in the Mary River region of the Northern Territory’s sprawling Kakadu National Park, Maguk is one of the most authentic nature experiences on offer in the Top End. After taking the Maguk turnoff from the Kakadu Highway, there’s 12 kilometres of unsealed road that that is best travelled by 4WD to access the falls. At the end of the road, there’s a two-kilometre (return) walking track that winds through the lush tropical savanna, giving travellers a chance to stretch their legs and see the Territory landscape and its wildlife up close. As you take the one hour hike into Maguk, the path will evolve along with the surrounding landscape before your eyes; starting out as a tropical forest boardwalk, transitioning into a sandy savanna strip, and then morphing into a rocky track to reflect the surrounding escarpments. People of all ages and fitness levels can enjoy the walking trail, with sandy patches, large rocks to clamber over, and stepping-stone water crossings keeping walkers on their toes. 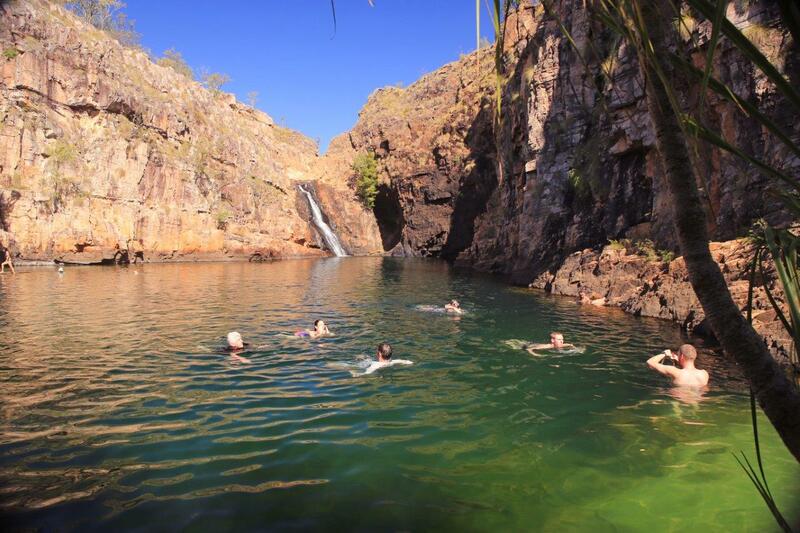 The ultimate reward at the end of the walk is the stunning Maguk gorge, where travellers can take in the towering escarpments and pandanus-lined pools, and take a dip in the soothingly cool waters. Even if you’re not a confident swimmer you can enjoy a paddle at Maguk – just stick to the edges of the main swimming hole where the water is shallow and the pool floor is sandy. Stronger swimmers can swim the length of the main pool to reach the falls where the water turns a deep shade of emerald under the shade of the surrounding rock walls. Bring along a snorkel and some goggles to get a good look at your new swimming buddies; the many freshwater fish species that call Maguk home. Local’s tip: snap up top spot under the cascades – having the waterfall massage tired shoulders is the Territorian’s version of a day spa treatment. If you can tear yourself away from the water, enjoying a relaxing picnic on the rocky edge of the gorge is the best way to take in the seclusion of the gorge. The best thing about Maguk is that it’s never too busy, so you can savour the views (and your lunch) in peace and away from the hordes. What’s unmistakable is that Maguk is a place of contrasts – it’s the adventure-lover’s playground as much it is a pleasure-seeker’s tranquil retreat. It’s where the lush tropics meet the rugged outback, and it has something for everybody, travellers and locals alike. 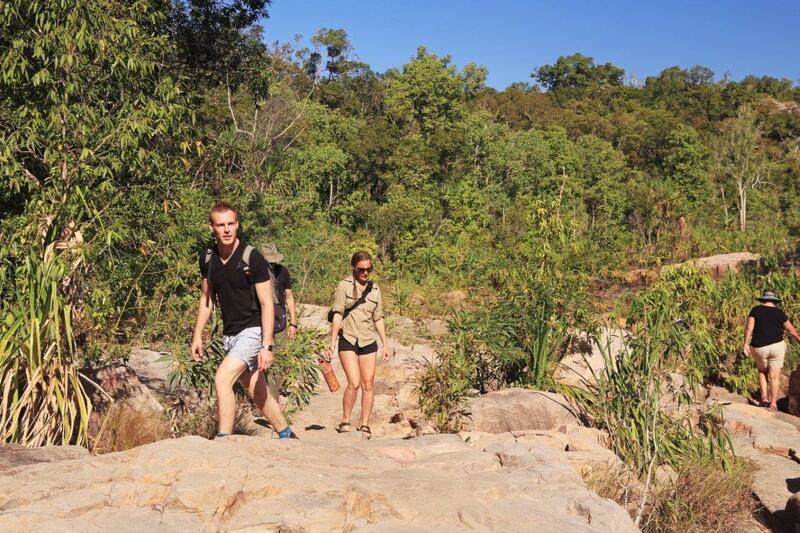 Venture North offers a five-day Kakadu, Arnhem Land and Cobourg Peninsula tour, which includes a stop at Maguk. Enquire or book with us today.